Friday noon 30th May and the grass bank above the cottage, a chunk of about 20m x 10m, is popping out chafers. I sat down amongst them as they crawled up stems from which to launch themselves. Such a beautiful sight and surprisingly no hungry birds swooping in for a seasonal feast. I looked up chafers on the web ... ‘Chafer larvae attack the roots of lawns and some ornamental plants, fruit and vegetables, while adult chafers feed on the leaves of a range of different shrubs, plants and immature deciduous trees.’ Should I be worried? I think not. In 2013 it was not until 9th June that the chafers emerged so summer is 10 days ahead of itself relative to last year. 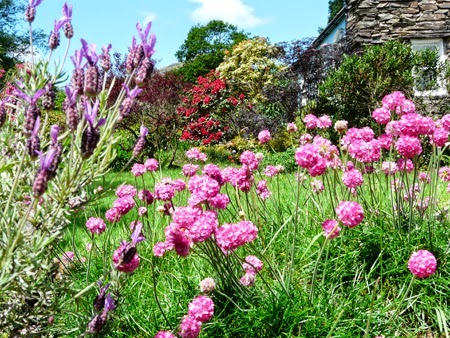 May is my favourite garden month with a riot of colours and so much promise. Tender young plants are hardening off on tables and chairs ready for release into the wild where they’ll have to combat the slugs. Slugging is a twice daily chore and beer traps are planted in amongst the runner beans which are surrounded by a ring of wood ash. Up on the platform Bird’s-foot Trefoil is poking through the grass. It takes precision strimming to cut the grass and not the flowers! Penstemon and wild geranium are immune to the goats and sheep. On the far side of the track on that steep bit of rock beneath the fence we’ve planted nasturtiums which hopefully will cascade down without being eaten. Will the FR herbicide reach up there? Words can't do it justice. In case you don’t visit at this time of year this is what the cottage garden, platform garden, vegetable garden and Dduallt garden were looking like on 21st May. 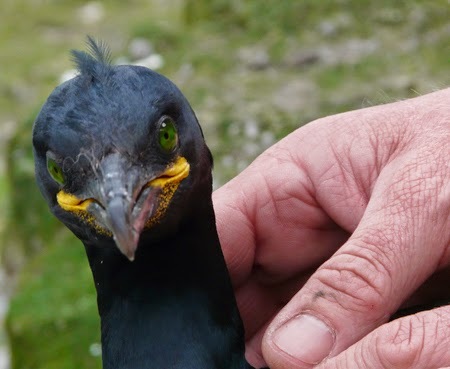 I really enjoyed my visit to Puffin Island with Steve Dodd (RSPB); he’s been ringing and monitoring birds here for over 30 years. It was a master class in how to catch a Shag with a shepherd’s crook and without being bitten. 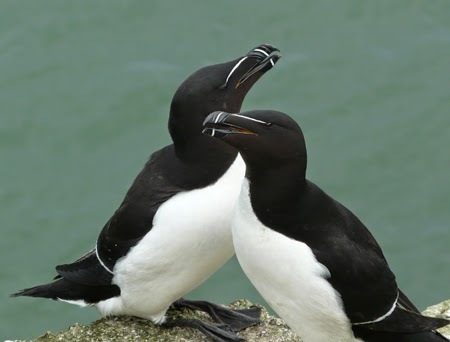 Also an impressive demonstration of plucking a Razorbill off a cliff with a noose on the end of a fishing pole. Essential requirements are a steady hand, a head for heights, balance and patience. The island is owned by the Barron Hill Estate and I am grateful for their permission to visit. It’s fantastic that there is this beautiful sanctuary, close to but free from humans, with no foxes, stoats nor rats. The rats got their come uppance with two tonnes of Warfarin about thirteen years ago. They used to feast on eggs and chicks during the short breeding season then the next nine months of the year they’d turn vegetarian. This kept the vegetation down but these days it’s a struggle to get around; Steve had a machete with him to hack a path through to the Cormorant breeding cliffs. Despite being named Puffin Island there are not many Puffins, maybe thirty to forty pairs, but on our visit we saw just two and three more out to sea. It was a privilege to be in amongst so many seabirds, it was so perfect I expected to bump into David Attenborough. I was so engrossed in the birds that I completely missed the eight dolphins that were swimming up close to the guided cruise boat which sails out of Beaumaris. It was a still day, perfect for sound. If you watch the YouTube film below don’t forget to turn on the speakers or better still put on some headphones – the sounds are more impressive than the sights. At last, sunshine and warmth after lots of rain. Weeds putting on a spurt and seedlings impatient to be planted. It was a magical day to be in the vegetable garden. Last year’s kale and swede are now six feet tall sprays of yellow blooms and very popular with the bees. Beneath a piece of wood a lizard but on reflection it must have been a newt – no scales and didn’t run away. 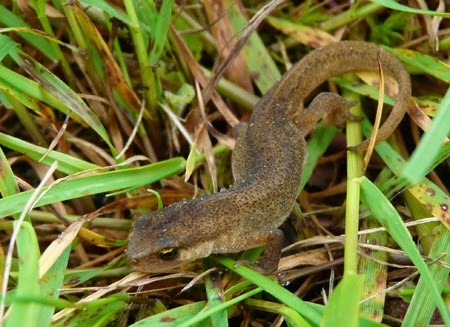 We see lots of lizards but newts are not so common; nearest pond about 30 metres away. Beneath a slab of slate busy black ants and pride of joy, in amongst the herbs, a hummingbird. Must report it to Cofnod, our Local Records Centre. It was the sort of day for hippos and ducks, but Molly doesn’t mind a bit of rain, so off we went, into the woods with wet bluebells all around. At the base of an oak was a cute little Tawny owl and I think I caught a glimpse of its parent flying away from the scene. 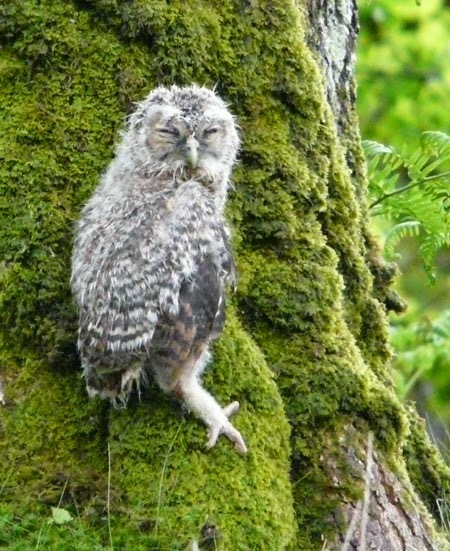 For a few minutes I watched from behind a tree, and then another, but all the while the baby was transfixed, not a move of the head, just the tiniest slit of a motionless eye and its claw set into the moss on the bark. I left it where it was and hope the parent will be back to protect and feed. 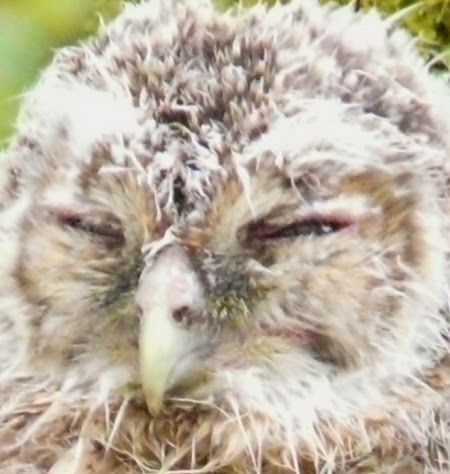 Two summers ago I found a baby Tawny being attacked by crows which I shooed away. I approached that baby and off it flew, into the trees; with dusk approaching it would be safe. For a couple of weeks I followed the progress of that owl and its fellow nest mates as they moved from tree to tree calling out for food. 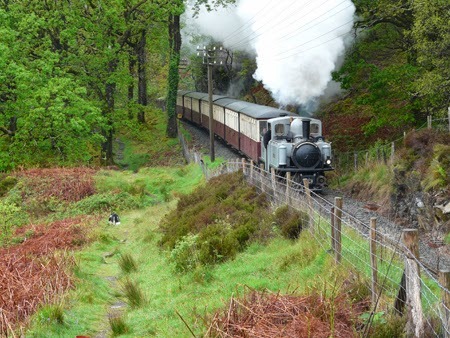 As if finding a Tawny was not enough excitement for one day there was a grey coloured Fairlie on the Ffestiniog - Dafydd Lloyd George after a paint job! Is this just an undercoat or here to stay? Rainy days can be good. I thought I’d test out a mini keg of Purple Moose and opted for Ysgawen. Following instructions I left it 48 hours to settle then the night before guests came round for dinner I felt obliged to check it was ok. Several glasses later I declared it fit to be served. The colour of golden straw, the smells of lemon and pineapple with the taste of elderflower; it was poetry in a pint. For £21.60 for 9 pints (5 litres) we had the luxury of CAMRA quality draught beer in the comfort of our home. Even Molly thought it was good! If you'd like to order some for your holiday than follow this link to the Purple Moose brewery.